A search throughout the kingdom proves fruitless. Then the lovely Rosamund appears at the palace, as if by magic, and Raphael is certain he has found his wife. She is intelligent and wealthy, as well as beautiful--certainly his equal, he thinks. But what does the mysterious Rosamund think? "Finding a princess who is the 'king's equal' in comeliness, intelligence, and wealth is an order that confounds the wisest, most loyal councilors in this distant realm. Finding a book equal in quality to this one is an even more formidable task. [Newbery medalist] Paterson weaves her story within the structure of familiar fairy tales. . . . Vagin's illustrations are exquisite." —SLJ. Vladimir Vagin lived in Russia until he moved to the United States in 1990. 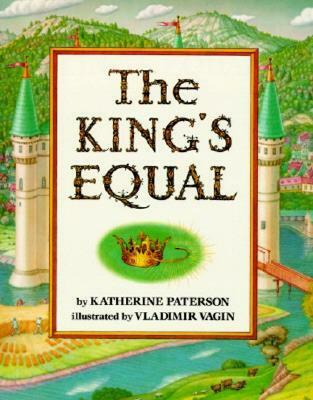 Mr. Vagin has illustrated several books for children, including Katherine Paterson’s The King’s Equal and Celia and the Sweet, Sweet Water. He lives in Middletown Springs, VT.